Includes everything you need to get playing. "Aim and chuck" corn hole-style fun, now more affordable than ever! 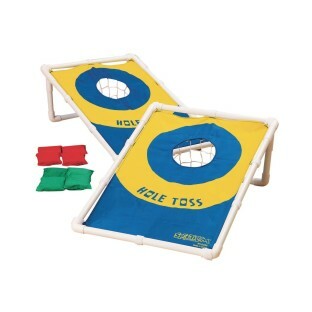 This classic tossing game features two 25-1/2" x 16-1/2" targets with fabric target zones and PVC frames, plus 8 beanbags (4 red, 4 green) and instructions. We are using this in skilled nursing and assisted living memory care. It's constructed well and light to carry between units. We store it on it's side on a shelf and it hasn't come apart.